Excellent Towel Set, AND they had the color I have been looking for, for what seems like forever!! Teal! They are beautiful and durable, and very high quality. I recommend this product. This is the perfect Burgundy towel set. I washed in cold water and they came out perfect and dried in no time. Matches my other items in bathroom. Gona order the set of 6. I love these towels. They wash great and soften up after first wash! They are retaining their color and are sumptuous. They are very generously sized. These are just fabulous towels..you won't be disappointed. I have been searching for the perfect bath towels from Overstock for months now. I have finally settled on these Natori bath towels in chalk. I didn't give these a 5 star rating simply because they could have been a little softer, heavier and larger. 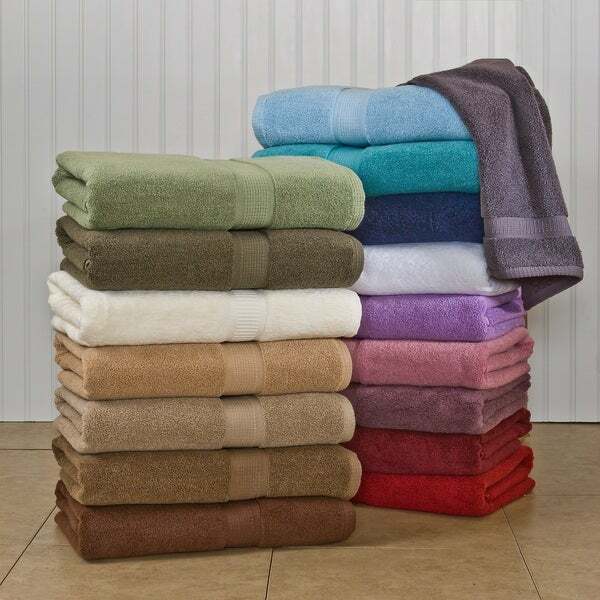 The only other towels that have come close to this kind of softness are the bamboo or the supima cotton. I would recommend these towels to a friend and as always the Overstock customer service is top notch. I could not believe the size of this bath towel and it was so very soft. I loved them. I would recommend these to anyone that likes big bath towels. This was actually the first big towel I have ever purchased. Could also be used as a beach towel. I’m afraid I miswrote....I reviewed the bath sheets as the towels. It really doesn’t make a difference as they all turned out to be better than I ever thought they would be. I purchased according to my pocketbook as I was sure I couldn’t afford the ones I thought I wanted. To my great surprise these turned out to be great, and a deal at that! These are the best towels I've ever purchased. Just the right thickness and so soft and absorbent. You can tell they are good quality because when you wash and dry them, there's not a lot of lint compared to other towels I've purchased. Very happy with these! Great thick towels, will be ordering more. I wasn't expecting this great quality for the price. I got the set for a spare bathroom no one uses and when I took them out of the package I was shocked. Very heavy thick &amp; not cheap at all. I got a deep brown and they are gorgeous! Sent mismatched colors, wash cloth color way off from ordered expresso color. Returning set. I would recommend these to a friend. Good price and good quality! I thought the towels were average, not too thin or thick. I really like them. I knocked them down a star because I ordered them in the color, sand, and to me they look gold and do not really match the bathroom as I intended. These towels are great -- super soft and larger than most. I have been looking for a specific color for several years and have found something here that is close enough. I only ordered one set, but they are ok enough for me to go ahead and order the rest that I need. OK but not best of the best. "I see most towels are in sets can I get only bath towels in large quantity about 200"